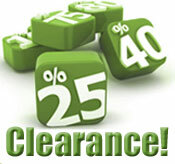 We offer Leather Motorcycle Jackets at discount prices. We offer a huge line of leather jackets, including naked leather jackets, racing style motorcycle jackets, and vented classic leather motorcycle jackets. All of our jackets feature zip out Thinsulate lining, heavy duty zippers, and are made from premium grade leather. 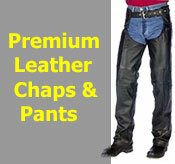 Look good while motorcycling. We have a complete line of Motorcycle Luggage including Motorcycle Saddlebags, Motorcycle Tool Bags and Pouches, Sissy Bar Bags, and Motorcycle Touring Trunks. We have Luggage that will fit every bike. Luggage small enough for motorcycle gloves and a cell phone or large enough to hold your motorcycle jacket, chaps, and cycle helmets. All of our luggage and saddlebags are handcrafted in the USA and are sure to please any motorcyclist. 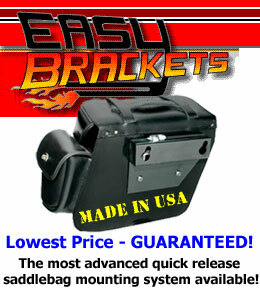 These leather Saddlebags are designed and built so you never have to worry about saggy, drooping saddlebags. 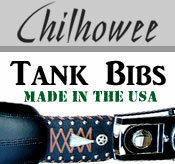 Need Motorcycle Boots to go with your other Chilhowee accessories? 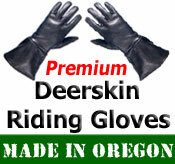 We carry a complete line of men's motorcycle boots and women's motorcycle boots. And just like our luggage, and leather saddlebags, they're made using only quality materials and leather and are built to last a lifetime. Chilhowee Motorcycle Leather full-grain leather motorcycle accessories for your Harley-Davidson or other cruiser aren't one-size-fits-all. All bikes have different sized motors - AND they have different sized tanks, fenders, levers, and other parts, too. The accessories Chilhowee makes are designed to fit each brand and model specifically - like a glove! Check out our Motorcycle Saddlebags, Motorcycle Tool Bags, sissy bar bags, Motorcycle Luggage, tank bras, fender bibs, Motorcycle Jackets, Motorcycle Boots,- all handcrafted from Buffalo, Cow, and Bull hide. Only premium domestic leathers are selected to make our handcrafted accessories. We handcraft Motorcycle Leather Accessories to fit your bike perfectly, including Harley-Davidson, Honda, Suzuki and more. National Service Animal Registry - A caring and comprehensive service dog and animal registry.